Photo(graphic) Memory 2 | Information...Super, Flyaway! Round 2 of Photo(graphic) Memory and I couldn’t resist this picture – it’s one that makes me chuckle and reminds me of a truly unique experience. This photo was taken during a 5 day trip up onto the salt flats in Bolivia, which involves long Jeep rides up into the mountains; a steady ascent into worsening and worsening altitude sickness! After several days of travels and staying in small mountain accommodations, we stopped at the side of a lake for some lunch and were watching the flamingoes dotted across the water. Then my sight fell on this sign and I just found its placement in front of the vast landscape and huge mountains extremely ironic and highly amusing! 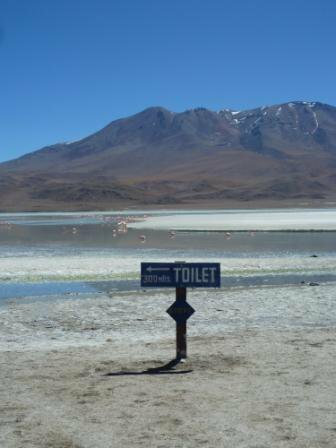 It seems that no matter where you are in the world, and no matter how remote, someone always needs to know where the nearest toilet is! ← Barcelona hotel – booked!